Dean Flynn spoke with David Pisker from Officeworks at the AIMIA Future of Digital Retail Conference on Thursday the 21st of August. He discussed a return to the local, and the understanding of the connection between channels to deliver traffic to your local stores. In looking at how we drive people to their local stores – the topic of multi-channel or omni-channel is central to most business strategies. But what starts out as a simple project, has the potential to quickly become overly complex, and it results in your business grinding to a halt. As a result the project grows too large for the benefits to be recognised in a timely manner. The reality is that the ecosystem in which retail operates requires constant evaluation. By engaging in overly complicated transformation projects, the capability to respond quickly to changes in the market is lost. Most importantly in this rush to get multi-channel right, your customers are being forgotten. Yes customers want to engage with your brand in any which way they desire (or in business jargon, using multiple channels), but trying to improve all of them at once may end with you delivering no benefits at all. Instead, list all of the multi-channel tactical opportunities you have, and prioritise them by what is going to deliver the most value to your customer. Once the top priority is agreed, break it down into actionable tasks. By focussing on the highest value items, and then understanding the steps to make it a reality, your journey to multi-channel nirvana begins through incremental benefits to your customer and in turn, to your business. For businesses, multi-channel is expensive, siloed, and generally there are separate P&L’s and with separate measures of success for online versus physical stores the problem is exacerbated. 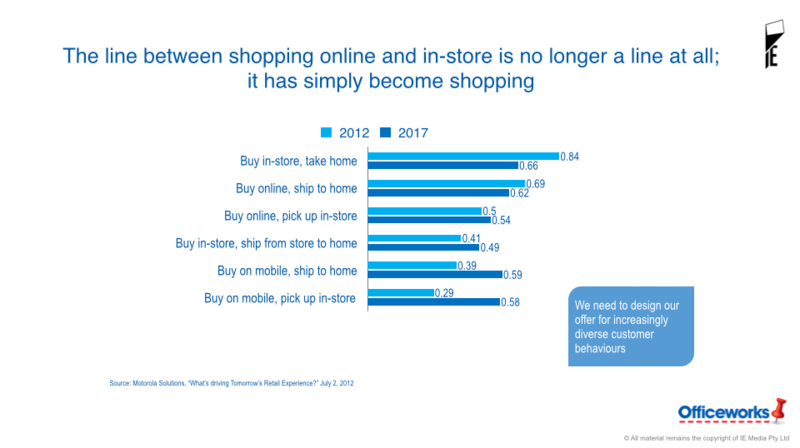 The link between customers researching online, and purchasing in store is well understood, with further evidence provided in AIMIA’s 2014 Australian Retail Research Report, however optimising the path to a customers local store is often forgotten. David provided insight in to their findings that a customer who shops online and in store is considerably more valuable than if they use individual channels only. That has pretty serious implications for our business, our category, and maybe for all retailers. The line between shopping online and in-store is no longer a line at all; it has simply become shopping. Today, many retailers build experiences around individual moments in which customers browse, purchase and receive products and/or services. This is old world thinking, and will expose them to greater customer churn through fractured brand and customer experiences. The risk will only increase as consumer’s behaviours continue to adapt to a seamless digital future as indicated in the “What’s driving Tomorrow’s Retail Experience” study. We think that over the next couple of years, click & collect from desktops will increase a further 10% and click & collect from mobiles will double. As customers purchase across more devices and expect better services, we will need to provide a cohesive, coherent and actively curated experience to maintain and enhance our customer relationships. So in fact this is not the death of the bricks & mortar store. It is the rebirth. It’s time to focus on the customer’s needs and desires beyond products and into experiences. Structure, capability and capacity to meet the new customer experience. To do this we must firstly make a fundamental shift in our thinking. We must focus on all channels all of the time and for each step of the shopping experience. Then it’s about shopping and not just channels, as mentioned above. We must also put the customer – their needs and desires – at the centre of everything we do – from the products that we stock, to the layout of physical assets, to the steps in a checkout wherever and whenever these shopping experiences occur. The store is a key part of the sales ecosystem. And like everything in an ecosystem it’s interrelated. The store is critical to your brand, it allows your customers to interact with your product and experience your brand. It’s important to understand the symbiotic relationship between online and store, and their relationship in delivering sales is critical to lifting performance across the board. Geo-targeting allows you to target customers on their mobile phone using location technology to drive local store visitation. It has the potential to be invasive, right? Like all marketing the execution will be critical to acceptance from your customers, any abuse (either by you or a competitor) is likely to cause reluctance from customers, so it is critical to be clear with your customers on the benefits they will get from interacting with your brand in this manner. The video below is an interesting example of geo-conquesting used to target your competitors stores. Mobile wallets are emerging as a great way to drive competitive advantage in the local store. Starbucks have done a fantastic job of using technology to provide convenience for their customer at a local store level through the use of mobile wallet. The next iteration of this will be smart watches. Reducing the need to pull out a phone makes this transaction even easier for a customer. Finally, everyone is carrying a mobile and they are thinking about your brand before they walk in to your store. As an example, they may have received your latest email on the train, opened it on their mobile, then once they’ve arrived in the city want to find a store. Make this process easy for them by ensuring your emails are mobile optimised and responsive, and ensure your mobile site has an easy-to-use store locator to help them complete their purchase journey. Better yet, rather than giving them a printed receipt, ask them if they’d prefer an email receipt and then you have an opportunity to continue building your relationship after the sale. Want to talk more about your return to the local?